into the Butterfly I always knew myself to be! Having contemplating my life story and its higher purpose recently, I have realized there are two stories alive in me, in my life! The first story is the unfoldment of my life from the time I was born till September 11, 2009. The second story emerged from the shattering and traumatic occurrence of September 11, 2009 till the present time and onward. The first story represents the events of my birth: the childhood conditioning I was subjected to within the context of my family, culture, and religion; how this conditioning and other circumstances and experiences shaped my self-identity and my core belief-system, how these structures created my life experiences, as well as the nature of my relationship with myself and with others, that was problematic, limiting and restrictive. In the first story, I lived from my ‘ego-mind’ disconnected from my Core Self. The second story of my life represents the evolution of my consciousness! In this story, I am consciously learning, experiencing and integrating the merging with my Essential-Core Self ~ the unification of my human self with my divine Self ~ healing the original split from my soul. What marked the shift from living from who I thought I was, to who I truly am, was a deeply shattering, traumatic experience, which occurred on September 11, 2009: the death of my only beloved son., his name was / is Nathaniel, whose’s meaning is “a gift from God” in Hebrew. Nathaniel was truly a gift from God! The experience of his passing, which I call “The Darkest Night Of My Soul”, was so devastating that it was as if it deconstructed my whole sense of self/self-identity. …my whole sense of self…my self-identity was shattered. There was a period of almost 6 months when I felt I was like a tree that had been pulled out of the earth from the roots and thrown into space. I felt as if I was floating in empty space-the space in my consciousness between what-no-longer-was, and what was gestating to be born-something new, although I had no awareness then of what it would be. I felt I was in between the worlds…the shock was severe! I had to face everything about myself, it was very difficult, but I had not choice about this…I could not run…I wanted to, I used to pace frenetically when the pain of grief would take over. As the journey progressed, I had to face everything about myself. My skills as a psychotherapist were helpful. In the space where there was a temporary loss of identity ~ old identity ~ In the ruins of my own shuttered heart, as I was facing all that was popping up from a less conscious part of my mind, I found myself becoming very close to myself, I was really seeing myself…all of it, I had to face what I did not like about myself, for instance…my guilt! This absolute intimacy with myself triggered a natural feeling of compassion. I observed all I did not want to see and learned to forgive myself! Something deeper than the intense pain of loss…from the depth of my soul was sprouting…little seeds at first…then eventually, full blooms. I felt so much love for myself. Then, as the journey progressed, it extended to everything and everyone. I was falling in love with mySelf ~ the inner Self ~ the one I had not primarily identified with, as I had identified more with my personality self. I was being the one to comfort, soothe, be gentle, kind and compassionate with myself. Listening to myself became a living practice. This love was the antidote, the balm that soothed my bleeding wounds! I realize now, looking back at my journey of transformation, which felt more as a transmutation ~ a death/rebirth process ~ what I went through was an energetic, alchemical process that changed my whole consciousness and, consequently, my self-identity-the process akin to what the caterpillar undergoes to become a butterfly. 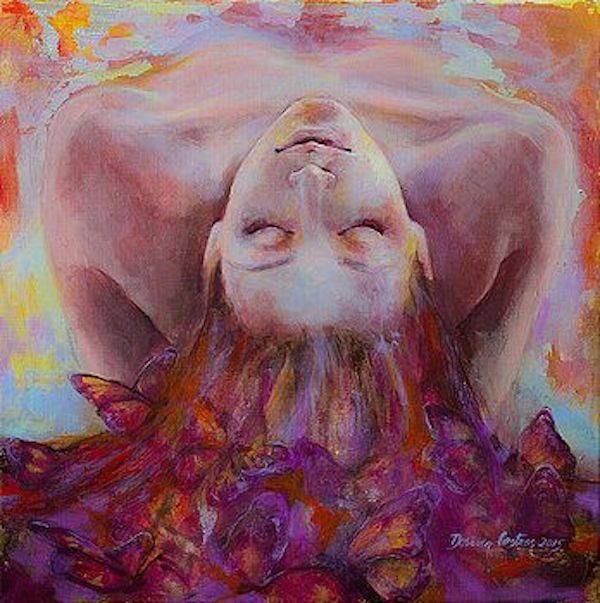 I have come to realize, this process of consciousness transformation, is a process we all have to go through to evolve ourselves from our small caterpillar self, into the magnificence and glory of the True Core Self ~ The Butterfly. universe driving our evolution…our journey of awakening and merging with our Soul! “divine baby” that is being born as part of the new ‘me’. I wrote this poem, “Tasting Mystery”, during the latter part of the grief process I traveled through, several yeas ago, after the loss of my son! The grief acted as a catalyst for deconstructing my old paradigm of consciousness, while creating a new one that allowed a more direct and intimate resonance with my Essence Self. My heart was totally shattered, since I grieved consciously, however, I was able to creatively reconstruct it with much more love, compassion, and empowerment! An incorruptible, deeply trusting and steadfast communication from Essence Self to personality self started to unfold…hundreds of inspirational poems were flowing through me. Essence Self was actively healing my broken heart…loving me through sublime communion, and creating beauty through the Spoken Word! I share this poem from my heart to yours, soul to soul, Self to Self!! !